• Uniform and vigorous piglets. • Docile temperament. • Fewer gilt development days. – more lifetime pigs marketed per gilt. • Outstanding longevity. • Low sow mortality. The Camborough is the ideal choice for farmers who want to experience high prolificacy combined with less costs per piglet. ￼• GGP and GP Lines. • Optimum Growth and High Appetite. • Excellent Conformation. • Strong Legs and Bone. 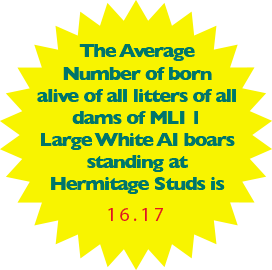 • AI Boars now averaging over 16 teats. Hermitage Maternal Landrace Lines have been developed over 50 years intensive of selection and testing for reproductive performance traits.The underlying Hermitage Maternal Line Breeding Programmes and BLUP selection indices have been specifically formulated to ensure our Landrace lines are produced with the genetic potential to maximize the number of pigs born and reared in a commercial environment. 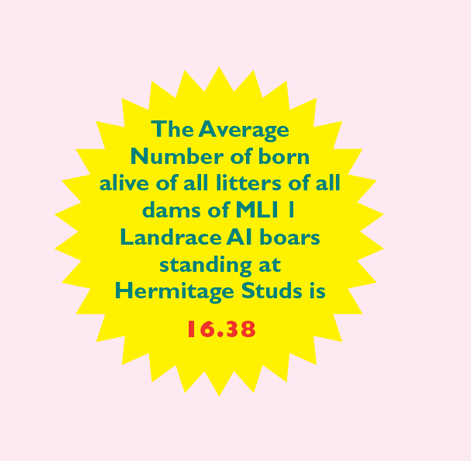 Hermitage maintain approximately 12,785 GGP/GP Landrace sows across our nucleus farms worldwide. • GGP and GP Lines. Hermitage Maternal Line Large Whites have been developed over 50 years of intensive selection and testing for reproductive performance traits.The underlying Hermitage Maternal Line Breeding Programmes and BLUP selection indices have been specifically formulated to ensure our Large White lines are produced with the genetic potential to maximize the number of pigs born and reared in a commercial environment. 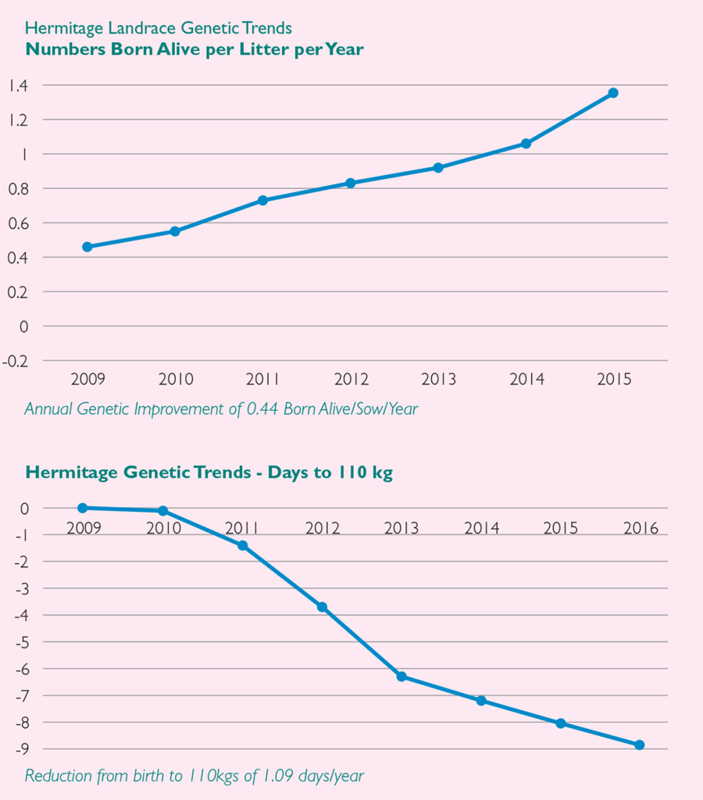 Hermitage have expanded our high health purebred Large White nucleus and now we maintain over 9,030 GGP/GP sows across the globe. The PIC-Hermitage Hybrid females are renowned for their prolificacy, longevity and mothering ability.The combination of maternal genes from our Landrace and Large White populations, enhanced by heterosis when crossed, ensure that the Hybrid females are among the most productive parent sows available in the market today. In addition to optimum prolificacy, the Hybrid females also produce uniform slaughter pigs with maximum growth, lean potential and carcass quality. 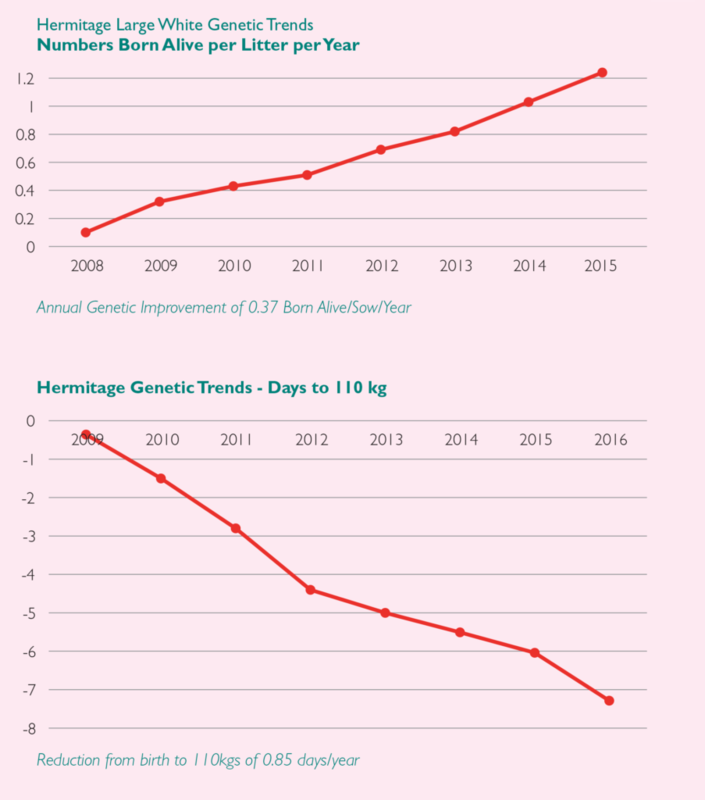 Over the years PIC-Hermitage Genetics have been used in over 100 high health restocks in Ireland alone. In addition many new herds have been established and restocks carried out across the UK, Europe, Russia, Ukraine and the USA. Advice on cleaning and de-stocking the unit. Advice on the cost of restocking your unit. Detailed timetabling and scheduling of each event as it will occur. Assisting with sourcing of facilities for the customer to harden off and serve gilts. Advice on choice of breeding programme. Supply of high performance breeding stock sourced from high health multiplication farms. Follow up advice and back up service. The PIC (GP) Line 19, white Duroc has been developed to produce the Camborough 50 gilt – ideal for outdoor production. The Camborough 50 is the progeny of the PIC®Line 02 x PIC®Line 19 and also suitable for outdoor production.